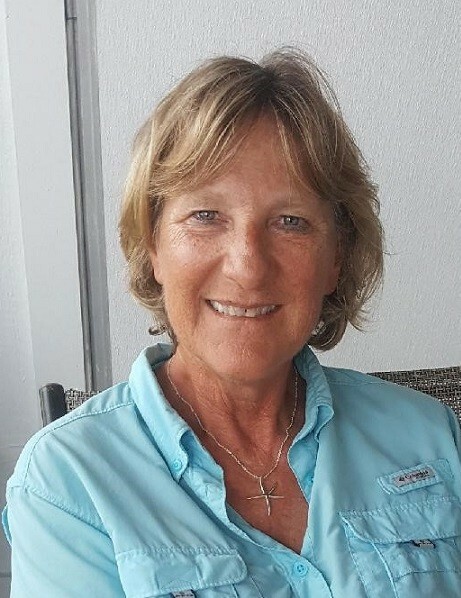 Black Creek – Rebecca “Becky” Cox Bass, 59, died Saturday, March 23, 2019, in her home. The family will be at Wilson Memorial Service, 2811 Fieldstream Dr, Wilson, Tuesday, 6:00 – 7:30 PM. Becky was a daughter of the late Austin “Rocky” and Laura “Pat” Conrad Cox. She was born in Landover, Maryland and moved to Wilson in 1970 with her family when they opened Cox Dodge. Becky was member of the Order of the Eastern Star where she served as treasurer for many years. She loved her time at Topsail Beach and fishing on the Jolly Roger Pier with all of her fishing buddies. Becky led a joyful life, had a contagious smile, and a positive attitude that reflected her laid back personality. She was a devoted wife and mother of three sons whom she loved dearly. After raising her sons, Becky spent many years as a substitute teacher at Beddingfield High School. She is survived by her husband, William “Jeff” Bass; sons, Austin Bass (Ann Spencer) of Charlotte, Parker Bass (Haley) of Goldsboro and Logan Bass of Topsail Beach; grandchildren, Payton and Riley Bass; sister, Wendy Winslow (David) of Wilson; brothers, Brad Cox (Gay) of Wilson and Shane Cox of Raleigh. In lieu of flowers memorials may be made to the Order of the Eastern Star, Chapter 145, c/o Nancy Tyson, 8601 Tyson Farm Rd, Stantonsburg, NC 27883.